If anybody want to take loan from any govt. 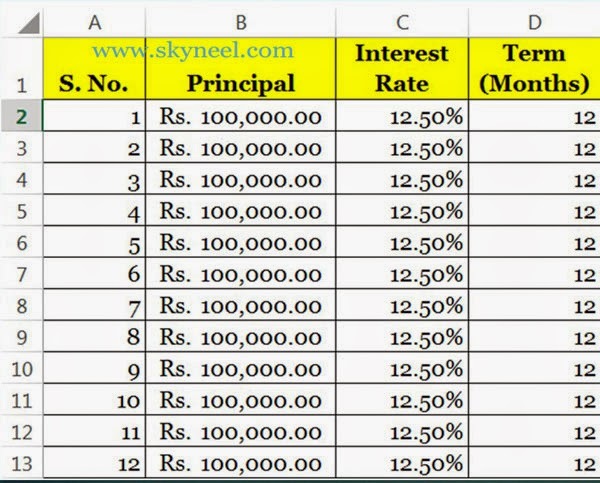 authorized bank or any private bank he must need to know what is the current annual interest rate is charged by the bank against the loan for a specific period and specific loan amount. PMT function is used to returns the monthly installment amount against the payment of a loan which is based on the specific periodic, and a fixed interest rate. It is very important to know how you can easily calculate monthly installment amount against to pay any loan with interest amount in MS Excel? Answer of this solution is you can use PMT() which is the most popular financial function of Microsoft Excel. PMT Stands for Payment Monthly Installment. We already discuss about calculate the future value of funds in MS Excel with Future Value (FV) function in previous post. fv: Future Value (It will be optional). If fv is not given then it is expected to be zero, that means the future value of a loan is 0.
part then it is assumed to be 0. If you want to take loan Rs. 1,00,000/- for the duration of 12 months @ 12.50% annual interest rate then how could you calculate the installment amount of each month including interest amount in the principal or loan amount. Step 2: Type the following formula in Cell E2. 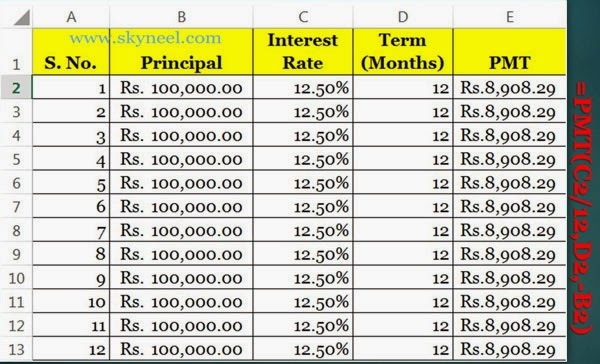 You have to divide annual interest rate by 12 to calculate monthly interest rate. =PMT(C2/12,D2,-B2). When you press enter key after typing the formula, excel displays Rs. 8,908.29/- installment amount of first month. Step 3: Now copy this formula in range E3:E13. When you calculate total of the range E2:E13 you will get following result Rs. 1,06,899.44. I hope you like this post and also sort out your problem regarding to PMT Function in Excel. Share this post in your friends and improve your knowledge. Give your important suggestions in the comment box. Thanks.